While the Yorktown Class carriers may have gotten much of the glory for their actions during World War II, the Lexington Class Carriers played an important part in fostering U.S. 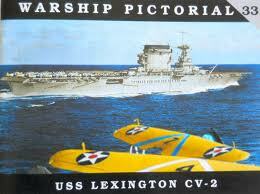 Naval aviation, and in carrying the war in the Pacific to the Japanese. While the “Big E” may be the most famous ship to come out of the war, the “Lady Lex” was known as the ‘Queen of the Flattops’. Conceived as massive Battlecruisers following World War I, to counter huge building programs planned by both the Japanese and Royal Navy (yes, the Royal Navy), the Constellation class was canceled under the terms of the Washington Naval Treaty. As one of the provisions of that treaty, the United States was allowed to convert two of the planned ships into aircraft carriers (the Japanese Akagi and Kaga had a similar genesis). The Lexington and Saratoga – the two ships furthest along in construction – where chosen for the conversion. Saratoga, the second ship in the class, was actually commission a month before Lexington in November 1927. Along with the Langley, Lady Lex and Sister Sara played a vital role in developing naval aviation, aviators and tactics in the years leading up to war. Up until 1937, when Lexington had her forward flight deck widened (Sara didn’t have her flight deck widened until August of 1941) the only way to tell them apart was the stripes they wore on their massive funnels. Saratoga wore a large vertical stripe, Lexington a horizontal band around her funnel. They were the largest warships in U.S. inventory until the Midway joined the fleet in 1945. After a short but eventful wartime career, Lexington was lost – after taking considerable punishment – at Coral Sea. Saratoga was considered by some a jinxed ship – she was torpedoed several times in 1942 alone – but she served with distinction throughout the war. At one time in late 1942, she was the only operational U.S. carrier in the Pacific. She was knocked out of the war for good in February 1945 by a Kamikaze attack, and at the last minute was substituted for Ranger and expended in the atomic bomb tests. Warship Pictorial Number 11: Lexington Class Carriers tells the story of these two ships from launch through demise in pictures. As with the Warship Pictorial on the Yorktown class, the book is divided into sections, one for each ship. Within the pagers there is a good mix of familiar and ‘new’ pictures. There are some particularly good shots that stood out: one of Lex in mid-1941 in a Measure 12 scheme (the same scheme that Yorktown wore) which I never knew she wore, and many of Sara at the end of her 1944 refit in which she emerged in a Measure 32 dazzle camouflage scheme. As with the pictorial on the Yorktown Class, I highly recommend this book to any naval enthusiasts. This book will come in helpful for anyone who plans to build one of the U.S.S. Lexington kits available today.